The center of Italy, Umbria. A little city called Spoleto, which is a charming ideal place to spend your dream holidays, is not far away from Assisi, Perugia, Todi, Orvieto,and Gubbio. Moreover, Rome, the most beautiful Town in Italy, is only 1 hour and 20 minutes away with the new direct train. Spoleto has very antique Umbrian origins from architectural, agricultural and artistic points of view. Spoleto was a Latin colony that transformed itself into a Roman community, which explains its diverse architecture. Life in Spoleto flourished, and many splendid monuments were built. At the end of the sixth century, Spoleto became the home of one of the most important Dukes of Longobard. The ancient bridge (Ponte delle Torri) leads the way to the towering Fortress ( The Rocca Albornoziana ) that is currently under renovation to become Spoleto’s first historical museum. Remains of the inside and outside city walls can still be seen, of both the Umbrian polygonal, and the Medieval Roman type. Medieval and modern monuments join together and amalgamate with Romans monuments. These and other buildings, churches, arches, and towers can be admired today by visitors who are interested in historical buildings and art. Travelers go out of their way to see Spoleto’s quaint streets, climb the moss covered stone stairs to the beautiful cathedral (Duomo), and to gaze over one of the most beautiful squares in Italy where performing the Spoleto Festival . 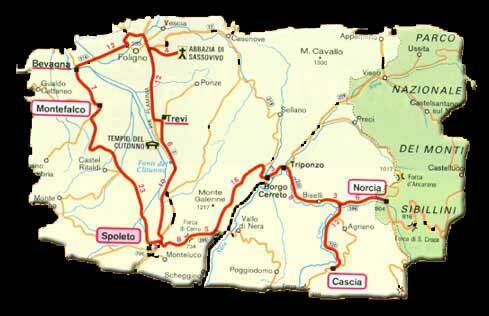 Rome-Spoleto: route Roma-Ancona for 141 km. Ancona-Spoleto: route Ancona-Roma for 156 km. All the towns and villages under the Municipality of Spoleto are connected to one another by public buses.